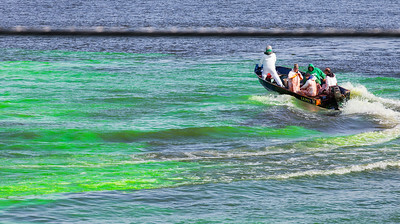 Whitney Rupp for Shaw Media Workers use flour sifters to spread an orange dye into the Fox River in McHenry Saturday, March 17. 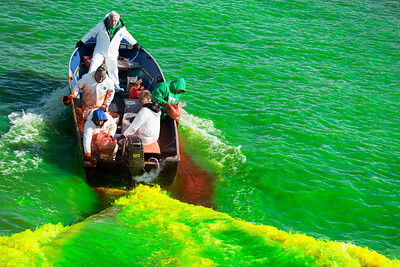 The dye mixes with the water to turn the water green. 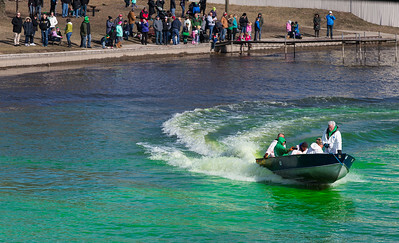 Whitney Rupp for Shaw Media A group of boaters drives under the Pearl Street Bridge Saturday, March 17 after the river was dyed green to celebrate St. Patrick’s Day. 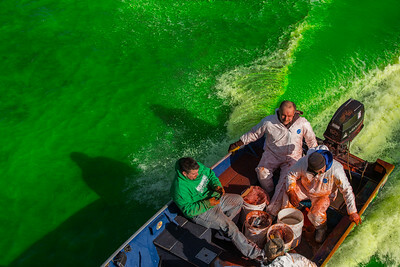 Whitney Rupp for Shaw Media Current from a boat carrying workers with orange dye helps to mix the dye and turn the Fox River green for St. Patrick’s Day Saturday, March 17 in McHenry. 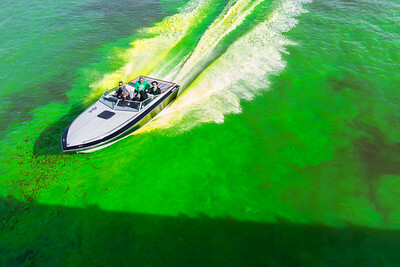 Whitney Rupp for Shaw Media Orange pellets dissolve in the Fox River and turn the water green Saturday at the Pearl Street Bridge in McHenry. 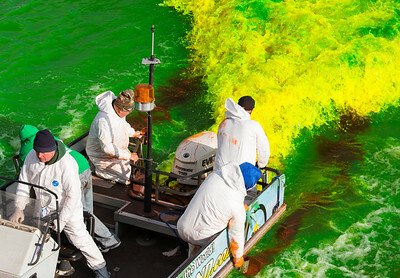 Whitney Rupp for Shaw Media People watch from the edge of the Fox River Saturday as a boat is used to spread dye. 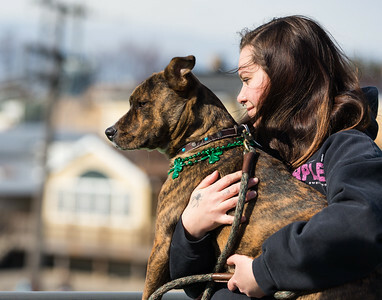 Whitney Rupp for Shaw Media Paige Delfino of McHenry and her dog, Buddha, watch the inaugural dyeing of the Fox River at Pearl Street Bridge Saturday, March 17. 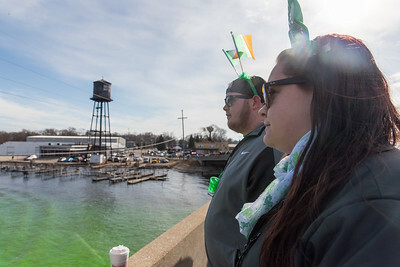 Whitney Rupp for Shaw Media Jason Jett and Brenda Liewald of Hebron stand on the Pearl Street Bridge the morning of St. Patrick’s Day. 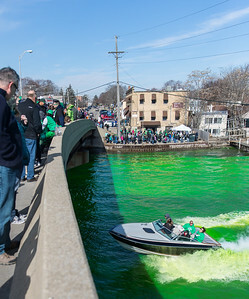 Whitney Rupp for Shaw Media Vincent Hohol, McHenry, celebrates St. Patrick’s Day on the Pearl Street Bridge in McHenry during the city’s inaugural dyeing of the Fox River Saturday, March 17. 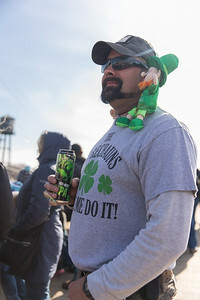 Whitney Rupp for Shaw Media A young group of friends and sisters pose for their mothers during the city of McHenry’s St. Patrick’s Day celebration Saturday, March 17. 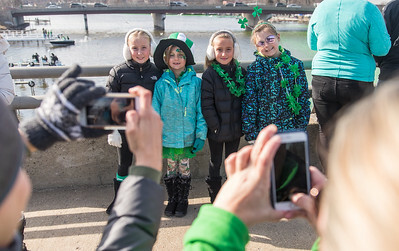 Pictured, from left, are Juliana Piotrowicz, 7, Kiera Kukla, 6, Jovanna Piotrowicz, 7, Khloe Kukla, 8, from McHenry. 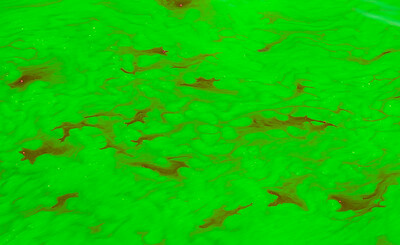 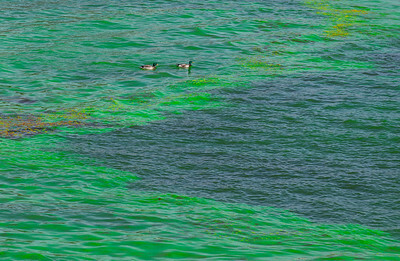 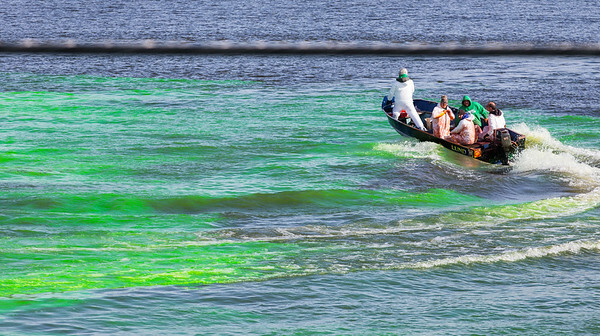 Current from a boat carrying workers with orange dye helps to mix the dye and turn the Fox River green for St. Patrick’s Day Saturday, March 17 in McHenry.